These simple principles operate the full range of the electric energy ecosystem. The principles apply from the household level to the entire North American grid. They are scaleable. 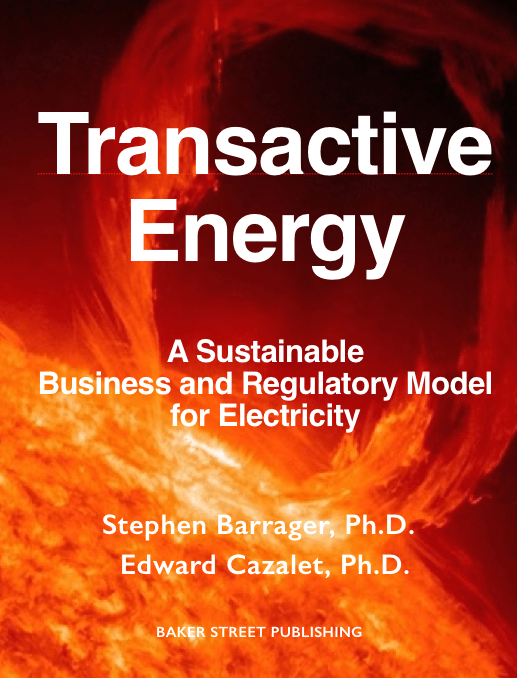 The Transactive Energy Platform is the heart of the TE system. We don’t have these platforms in retail markets today. The TE Platform is where all parties come together to buy and sell forward and spot transactions. Today we have some platforms associated with Independent System Operators (ISO’s) and Regional Transmission Operators (RTO’s.) 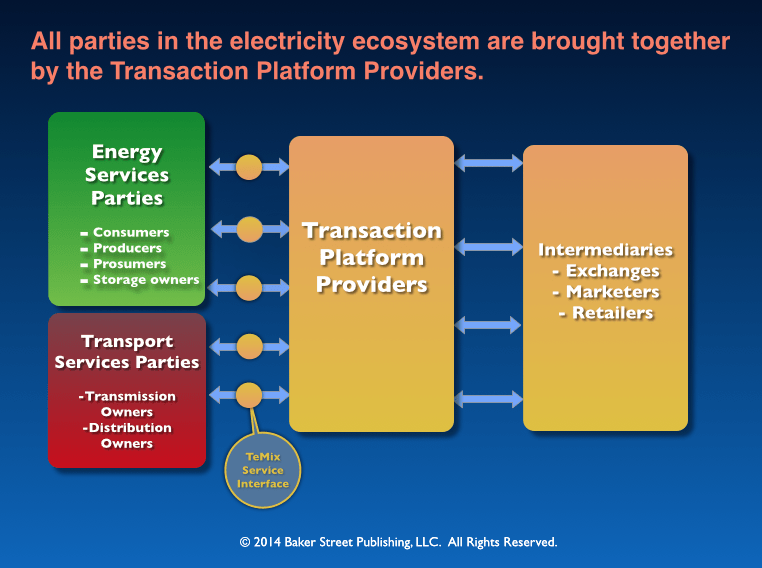 Ultimately there will be many TE Platforms spread throughout the energy ecosystem. Physically they will probably be on servers in the Cloud. When I say the TE business model is “scaleable” I mean that the system can be easily enlarged to accommodate growth. 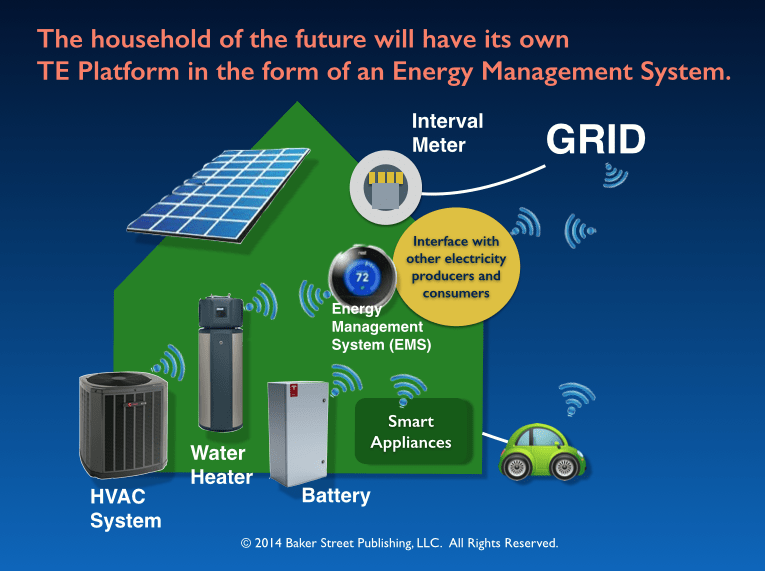 We could start with a TE Platform at the neighborhood level and grow it to the North American grid level without changing the four rules listed above. The EMS will access wholesale energy prices and marginal transport costs through the TE Interface. The Interface will connect with one or more TE Platforms. The EMS will be capable of operating all the devices in the home in a way that meets customer desires in the most economic way. Forward transactions will be used to make investment decisions and spot transactions will be used to make device operating decisions. It is efficient and transparent. The next level of aggregation is the microgrid. 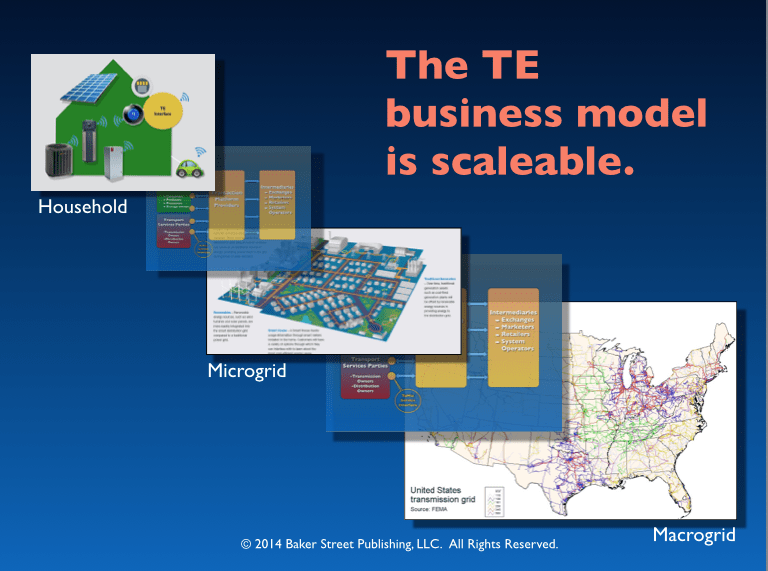 The microgrid can use the TE business model to optimize within the microgrid and between the microgrid and the grid. The TE business model continues to work up through the community level, state level, and national level. The same principles that are used to allocate resources and operate devices at the household level apply at the macro level. Investments in transmission can be made based on forward energy and transport transactions. The system can be operated based on spot transactions. All parties act autonomously. (National security, environmental concerns, and safety will have to be considered. However, the fundamental design and operation of the system can be based on the TE model principles.) No command and control or resource optimization logic is necessary to deliver what is in the social and environmental interest. Forward transactions also allow risk management across the spectrum. Homeowners can use forward transactions to lock in savings from investments such as solar panels. (See the Solar City website. Solar City offers many forward transaction options for the homeowner. They take the form of leases and/or long-term contracts.) A microgrid can use similar forward transactions to manage the risk associated with large storage units. There are many examples of forward transactions in current electric power markets. Central station solar and wind producers already use long-term contracts and Power Purchase Agreements (PPA’s) to manage investment risk. In summary, we do not need to make the distinction between nanogrids, microgrids, or macrogrids in the TE business model. They are a continuum. It simplifies doing business and regulating.